After all the festivities that we saw in the last 2-3 months, life has come back to normal. There are routine and regular activities taking place in my life as well as in the kitchen. A post-it with ideas for breakfast is hanging on my fridge – more than being the ‘organised’ kinds, I am more of the forgetful kinds who needs notes all over the place to remind me of chores waiting to be finished. So yes, a comprehensive list was drawn keeping everyone’s tastes & preferences in mind. This helps simplify things a lot during the week when the early morning madness grips me. Most mornings see me running around like a headless chicken. And sometimes my face draws a complete blank at the mention of ‘what’s for breakfast?’. So a list of breakfast ideas helps me plan ahead, stay in control and put something that is satisfying yet quick on the breakfast table. Pooris (deep fried flat bread) are undoubtedly the family’s favourite, however, it’s not one of the healthiest options for me as there is deep frying involved – but an occasional (read monthly) indulgence is pardonable. Though it is not one of the ‘quick’ options on my breakfast menu public demand cannot be turned down easily you see. And then the thought of tearing a piping hot Poori and savouring it with some delicious side dish like this Ghashi has me drooling from the night before and so in an almost mechanical fashion you will find me doing the drill – washing & soaking the chickpeas, checking if a coconut needs to be freshly grated and if there is sufficient whole wheat flour in stock. Until I discovered this recipe, I used to always team up Pooris with Baaji – a spiced mashed potato side dish that is famously found under wraps (literally!) in a crispy Masala Dosa. Poori Baaji is a famous Mangalorean dish that is eaten along with the morning or evening tea. However the other lip smacking alternative is to eat the Pooris with Chane Ghashi (chickpeas in a spiced coconut base) or Kurma (mixed vegetables in a spiced coconut base). 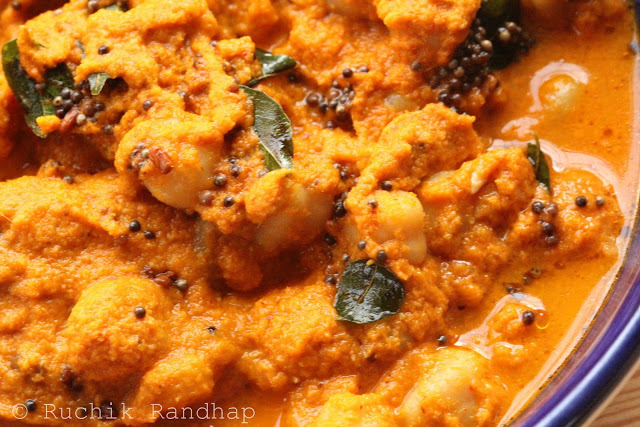 These two variants are typically famous Konkani preparations and you are bound to find either or both on the menus of some famous oota-thindi (meals & snacks) restaurants in Mangalore. The best part about writing a blog is that one gets to make friends from all walks of life. What makes it even better is that when requested these friends more than willingly contribute tried and tested recipes, handed down from their own mothers and grandmothers, tweaked to perfection with every try. These are the recipes I love to try with confidence. So a big thank you to Mrs. Vidya Nayak Shenoy who I met via Facebook and whose Dali Tove recipe is a much loved staple in my home and has received a lot of applause and appreciation from many readers who have tried it with perfect results. She was also kind enough to share her Khotto/Khottige (Idlis steamed in Jackfruit leaf baskets) recipe with the fine details. Although I had taken this recipe from her long back, it never made it to the blog despite having been tried several times in my kitchen. You see, the mad rush in the mornings to make breakfast, pack my son’s snack box and send him to school takes up all my energy and then I am in no mood to click any pictures. Today, invariably I knew I had to do it as my Pooris came out quite good (although not perfect – I am still working on them). But by the time I captured the Ghashi the Pooris fell flat 🙁 Nevertheless, I knew that this recipe, irrespective of the quality of pictures needed to be shared. It would be a shame not to! This is one recipe, like the Dali Tove, that is simple to put together and so very yum! 1. Drain the soaked chickpeas and refresh with fresh water. Add enough water to cover the chickpeas, add salt to taste and pressure cook for about 6-7 whistles or until the chickpeas are tender. Turn off the flame and allow the cooker to cool down to room temperature. Remove the lid, stir and keep aside. 2. In a heavy bottomed pan heat 1tsp oil and toss in the dry chillies and fry for a half a minute. Grind them along with the rest of the ingredients mentioned under ‘For the masala‘ to a fine paste. 3. Add the ground paste to the chickpeas and add the stock or sufficient water to arrive at a thick gravy like consistency (make a thinner gravy if you wish to eat it with rice). Check salt to taste. Bring the curry to a boil. 4. In a smaller pan heat the oil for seasoning. Toss in the mustard seeds. When they stop spluttering add the fenugreek seeds & curry leaves and immediately take off the flame. Temper the curry with this seasoning and cover the pan with a tight lid. Turn off the flame. 5. 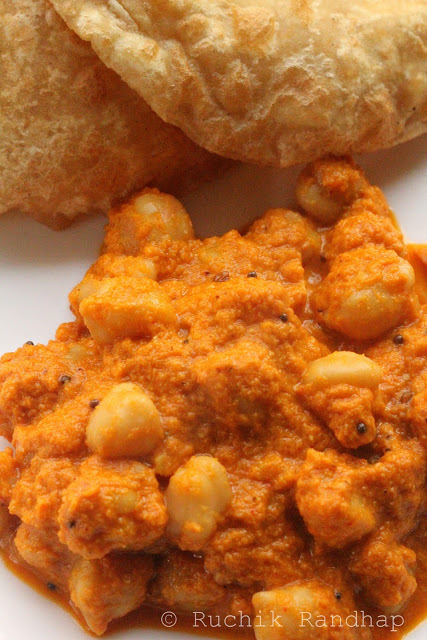 Serve hot with pooris (recipe here), chapathi or rice. looks like a match made in heaven shireen- loved your khottos & dali ove recipes too !!! what's for BF drives me nuts too ! Wonderful recipe Shireen..very different from the way we usually make chana masala..I must say that this is a must try recipe. How very different!! And so wonderful looking!! Slurp! Lovely and delicious looking chikpeas curry. 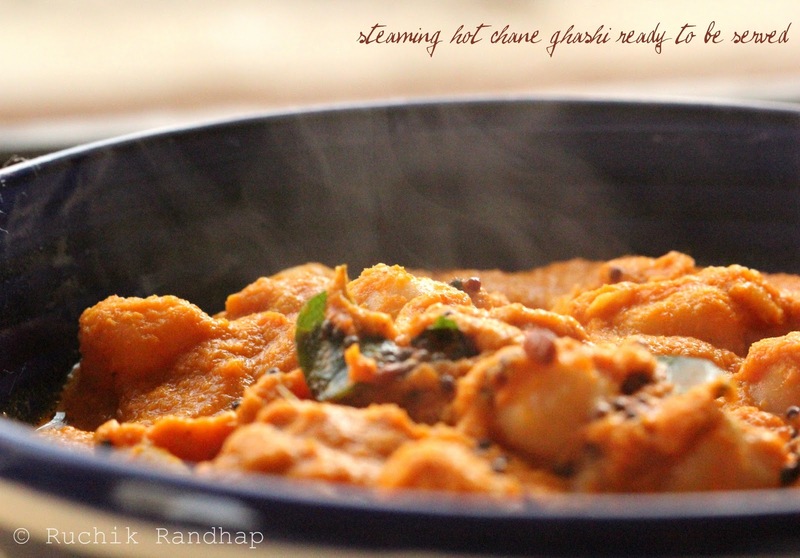 superb chane ghashi!a totallt different way of preparing the chick peas..lovely…….i tried out the chicken chettinad recipe and it was finger licking yum!..thanks so much. Seriously cant take my eyes from ur irresistible clicks,super tempting and droolworthy chickpeas curry.. Thanks everyone for your lovely comments!!! I tried it out yesterday!! yum yum! Very Delicious! Thank u Shireen for the recipe! 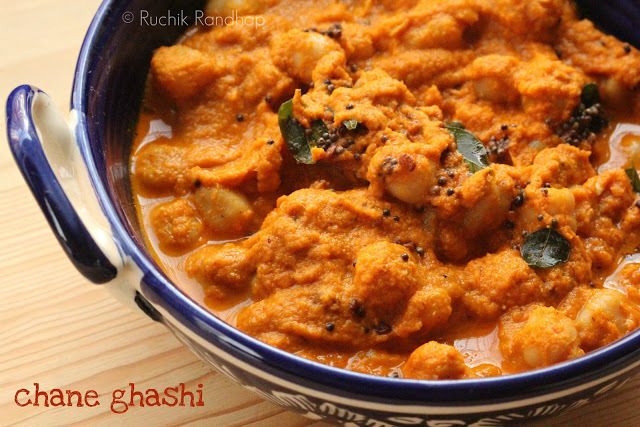 i am always looking to change up the usual chana recipes.. this looks like a perfect one to try! hello shireen..Nice post . Ghashi color is very tempting. Next time you can try and combination of chickpeas with Kadgi (raw jackfruit) or yam. 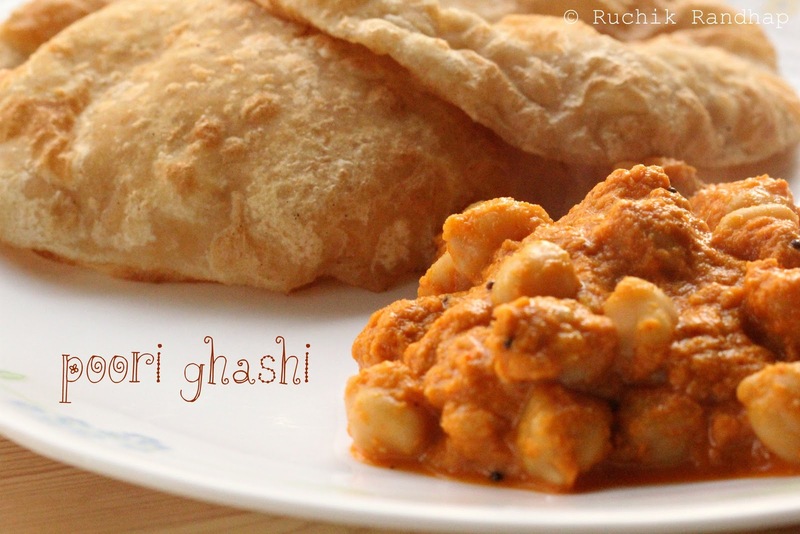 This is an authentic GSB konkani combination for Channa gashi. @ Amanah: Thanks so much for your feedback! I am so happy to know that the dish was well received by your hubby too 🙂 Do stay tuned for more recipes!